Barcode click is a very fast and agile barcode scanner on a click board™, which is compliant with a wide range of different 1D and 2D barcode protocols. The barcode scanner module is equipped with the micro USB port; thus, it can work both as a standalone device and a standard click board™, which communicates with the MCU via the RX, TX, RST and PWM pin of the mikroBUS™. The barcode module has two red LEDs, used to illuminate the area in low light conditions. Also, Barcode click features two push buttons, used to control the device when working as a standalone device. The LV3296, a compact integrated barcode scanner from Rakinda company, is the main component of Barcode click. This is the advanced barcode scanner/reader module which features the patented UIMG®, a computerized image recognition system technology that supports all mainstream 1D and standard 2D barcode types (for example - PDF417, QR Code M1/M2/Micro and Data Matrix) as well as GS1-DataBar™(RSS) (Limited/Stacked/Expanded versions). It can read barcodes on virtually any medium, including paper, plastic, mobile phones, LCD displays, etc. Thanks to the used area-imaging and UIMG® technologies, the device is able to scan barcodes rotated to any angle, with great speed and precision. The LV3296 scanner module uses a flat cable to connect to the click board™, via the ZIF FPC connector on the back side of the PCB. This flat cable carries all the signals used in communication between the LV3296 module and the host MCU, such as the RX, TX, buzzer, USB, interrupt, reset, and scanning trigger lines. The communication with Barcode click is done by utilizing two types of connection it offers - UART (TTL232) and USB. When the click board™ is placed into the mikroBUS™ socket, it will be able to exchange data with the UART module of the MCU, via the standard mikroBUS™ RX and TX pins. When the Barcode device is first powered up, it will sound a greeting message, which indicates the successful initialization. The device is now ready to scan. Pressing the onboard TRIG button or pulling the PWM pin of the mikroBUS™ slot to a LOW logic level for at least 10ms, will trigger the barcode scan. It will turn on two LEDs and project a circle shaped aiming pattern on the surface it is aimed at, scanning it for a valid barcode. Both LEDs and the aiming pattern can be turned off in the configuration. A short beep sound and a blink of the Good Read indication onboard LED (GR) will indicate a successful barcode decoding and after releasing the TRIG line (configurable), the device will send the decoded information to the selected interface. Barcode click can report errors, with a distinctive error message sound - e.g. when the device is configured to use onboard micro USB, but it is not connected to the host USB device, it will sound an error if scanning is attempted. The RST button is used to reset the device. Pressing the RST button or pulling the RST line, routed to the mikroBUS™ RST pin to a LOW logic level for 100us to 500us will cause a device reset, followed by the greeting message sound. It should be noted that the device should not be reset too frequently; at least 2 seconds delay should exist between the reset cycles. 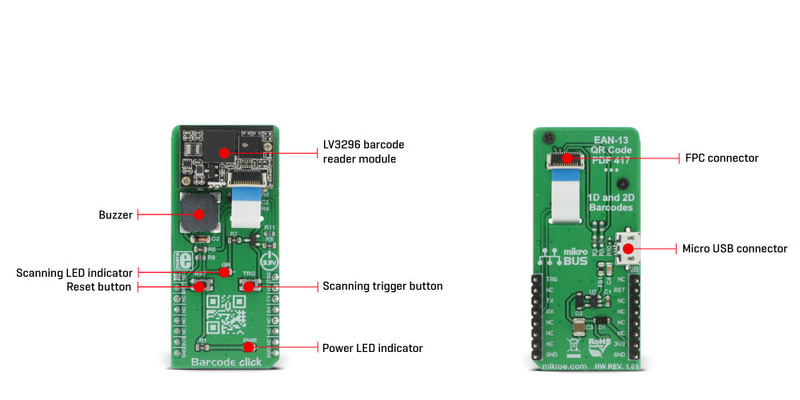 Note: Barcode click is powered only with 3.3V from the mikroBUS™ thus it is not able to work with the MCUs and systems which work on 5V. Applications An ideal solution for fast and accurate scanning of various types of barcodes.